CEDIA is a lifetime school for us and the Awards represent the highest honor for us and our industry. We have been founder members since 1997 and the hard work that our team has put in all these years is now being internationally recognized. Although we come from the very small island in Cyprus, the challenges are there, the demanding clients are the same and our work proves to be of international standard and professionalism. 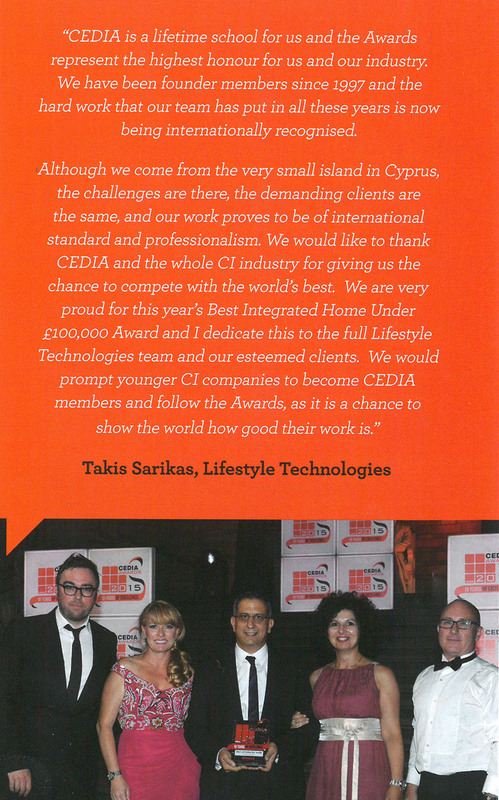 We would like to thank CEDIA and the whole CI industry for giving us the chance to compete with the world’s best . We our very proud for this year’s Best Integrated Home Under £100,000 Award and I dedicate this to the full Lifestyle Technologies team and our esteemed clients. 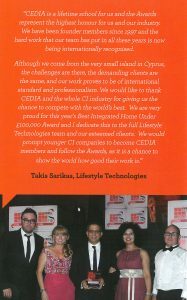 We would prompt younger CI companies to become CEDIA members and follow the Awards, as it is a chance to show the world how good their work is.